The Gay Science: [German: Die fröhliche Wissenschaft], is a book written by Friedrich Nietzsche, first published in 1882 and followed by a second edition, which was published after the completion of Thus Spoke Zarathustra and Beyond Good and Evil, in 1887. This substantial expansion includes a fifth book and an appendix of songs. It was noted by Nietzsche to be “the most personal of all my books”, and contains the greatest number of poems in any of his published work. The book’s title uses a phrase that was well known at the time. It was derived from a Provençal expression for the technical skill required for poetry writing that had already been used by Ralph Waldo Emerson and E. S. Dallas and, in inverted form, by Thomas Carlyle (see The dismal science). The book’s title was, however, first translated into English as The Joyous Wisdom. 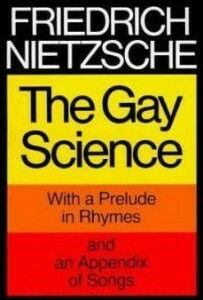 Nevertheless The Gay Science has become the canonical translation of the title since Walter Kaufmann’s version in the 1960s. It was noted by Nietzsche to be “the most personal of all my books”, and contains the greatest number of poems in any of his published work.